BT3002 single cables, 75ohm RF cables coaxial. RF cables BT3002 is a coaxial cable with a 75ohm solid center core (1×0.31mm) and a briad shield with a PVC Jacket. The outer diameter is 3.5mm. 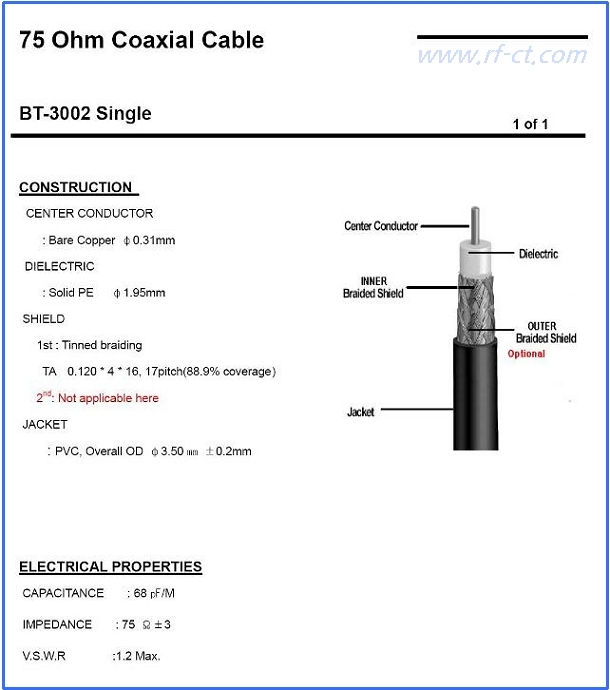 BT3002 coaxial cable is commonly used for interconnection of data or telecoms equipment with 75ohm connector like SMB RF connector, 1.0/2.3 RF connector, 1.6/5.6 RF connector.